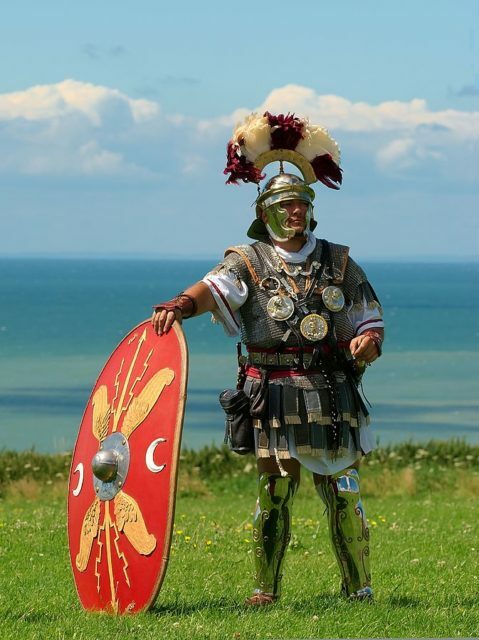 It’s the first century AD and the Roman army is at the height of its power and professionalism. You’re part of that army – a soldier with years in the ranks. But battlefield experience is still a rare thing. Most of the warfare is marching, waiting, and digging the trenches for siege camps. Today is different. Today you face the enemy in open battle. You’re about to experience war at its most intense. You’ve formed battle lines before, going through the motions hundreds of times on the training ground. It comes easily to all 80 men of your century. At the shout from your centurion, you form up into four ranks, alongside the other five centuries of your cohort. Your cohort is in the forward line, facing the enemy across the open plain your general has chosen to fight on. 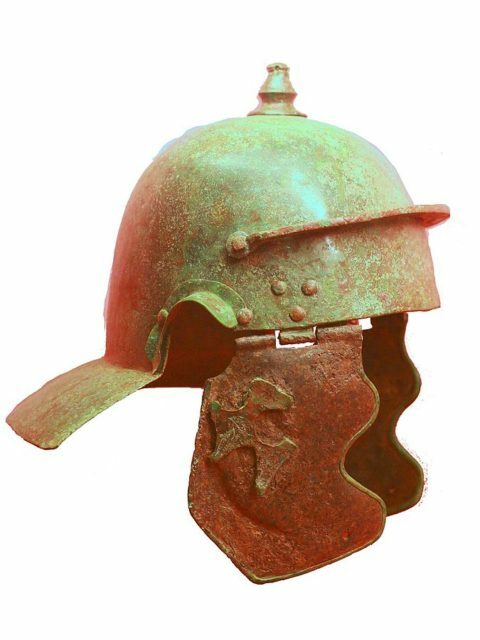 Looking to left and right, you see long lines of men in matching armour and helmets, all carrying curved rectangular shields called scutum. 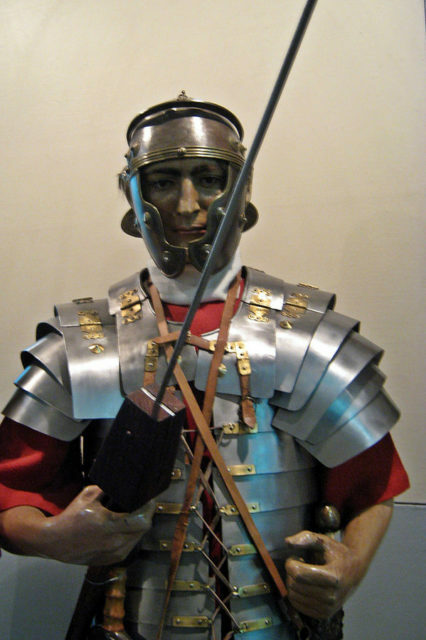 Like you, every man carries a pilum or throwing spear, and wears a gladius, a short stabbing sword, at his waist. Far off to left and right, cavalry and irregulars form the flanks of the army. Some of the cavalry are Roman citizens like you, natives of Italy, but most of those flanking forces are irregulars raised from conquered provinces. 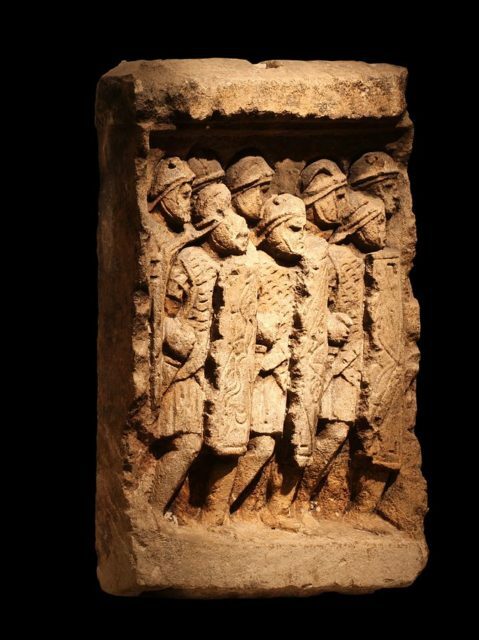 You can’t rely on them like you would your brother legionaries. At last, the order comes and you begin to advance. You march in your lines, keeping close formation. There are gaps between the cohorts, into which those of the second line can move if needed. The third is held in reserve. 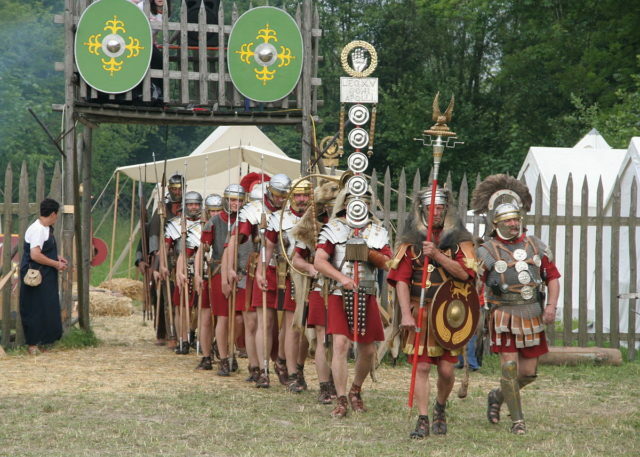 Reenacters portraying Roman legionaries of Legio XV Apollinaris. By MatthiasKabel – CC BY-SA 3.0. Each century has its own standard bearer, and looking at yours helps you to keep in place. By timing your footsteps to match those of your unit, you are easily able to keep formation. If you don’t then the optio – your centurion’s second in command – is watching from the back, ready to shout you into line. You can hear him now, berating someone who has moved from their position, pushing them back into place with his baton of office. Discipline is vital to the legions. The only people not in formation are the officers and the messengers who ride between them on swift horses. You know a few of the officers by sight. You even know the name of the general and of the legate leading your legion. But that’s all you really need to know. Their orders will reach you through the centurion. A rider gallops past. The enemy has charged on the left flank. You can hear the clash of iron and their war cries. The messenger is galloping away to report to the general, telling him how things look on the ground. It’s the only way officers can stay informed across the front. There are men with bows and slings among the auxiliaries, but missile weapons aren’t for men of the legion. Your enemies are different. They’ve brought archers to the centre of the battle, a loose line of skirmishers who start firing at you. There’s no way to dodge, no hope of avoiding them hitting your tightly packed ranks. So you raise your shields, the men behind lifting theirs up above your heads, protecting you as you protect the front of the formation. Arrows rattle off this wall of wood and leather. One buries itself in your shield with a thud. Next to you, a man gets unlucky, an arrow finding its way through a gap and piercing his arm. As he drops back, cursing and bleeding, another man takes his place. The enemy is yelling and screaming, beating drums and blowing trumpets in the hope of intimidating you, scaring you off before the fighting really beings. 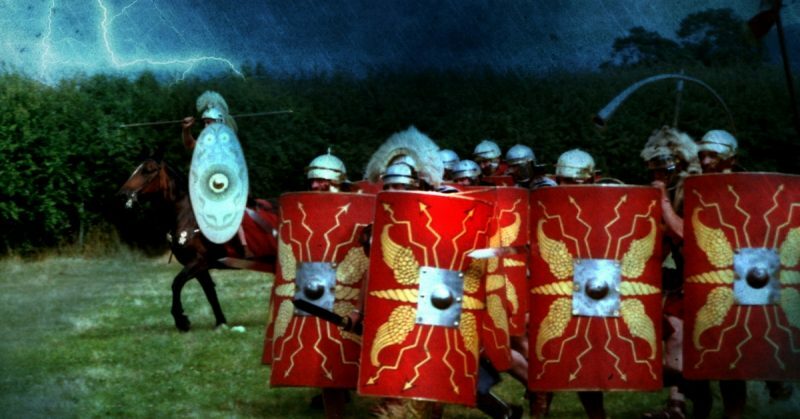 But Romans are not so easily scared, and yours is a more civilised form of intimidation. As you march on the barbarians you do so in stern, calm silence. At last, you’re close enough, the enemy less than thirty yards away. An order runs down the line. You lift your arm, draw back your pilum and fling it with all your might. You don’t wait for the enemy to come to terms with the shock of hundreds of heavy spears penetrating their ranks. As soon as the pila are thrown you yell at the top of your lungs and charge. Suddenly the cold, calm, silent legion turns into a storm of swords and fury crashing against the shore of the opposing army. You see the barbarians falter as this second shock kicks in. Sometimes that is enough to send them fleeing, but not today. Today they are made of stronger stuff. Today you will fight. Your aim, like that of everyone here, is to kill one of the enemy and step into the gap. That way you can force a break in his formation. A battle is all about the will to win. Once their formation starts to crumble and the enemy loses faith in their ability to hold, then they may run. Your hope is that they break before you. The first attack doesn’t get through, and both sides back off, shouting at each other. The barbarians throw a few of your pila back at you, but they mostly hit shields. Then you charge again. It’s hard, brutal work, as blows pound your shield, jarring your arm. You can only see what’s happening immediately in front of you, only attack whoever’s there, stabbing with your short sword, not swinging as that’s hard to do this close-up and more easily parried. Soon your arm aches, and your armour is chafing at your shoulder where the padding has slipped. There’s blood on your arm, and you’re not sure whose it is. Set soaks your tunic. At last, there’s a cry from further down the field. The line has broken. The warrior facing you turns to run, but you don’t give him the chance. You cut him down from behind. Now is when the real killing will begin. Some of the enemy back off tentatively while others simply run. Neither tactic will do them much good if they can’t get out of the way. You advance quickly, making sure the remains of that formation are put to flight. Then there’s a shout from the centurion. You dress the ranks, lining your shield up against that of the man next to you, and wait to see where the battle will take you next.